In case you missed the first one, check out the se-quality-project tag. The quality project isn't one that we plan to ever finish, it's perennial and kicks in every 18 months or so after we've had ample opportunity to observe the efficacy of our previous efforts, changes in how people use our sites along with feedback regarding what they expected, and when new ideas seem promising enough to try. It's time to talk about the areas that we're going to be focusing on. I'm going to give a high level overview of the types of things that we want to do, and touch briefly on things that we have in progress. I'll then turn it over to you. It's then your turn to mention a feature-request that you think might be a great idea for us to evaluate for inclusion in this iteration, and we'll then take a look at all of it to see what we're going to be able to build. We can't do all of it, but we're going to put the highest priority on small-ish things that could potentially make a big impact first, and then drill down into things that are going to take a bit of work, again with priority given to things that could help the largest number of users have a better experience on the site. 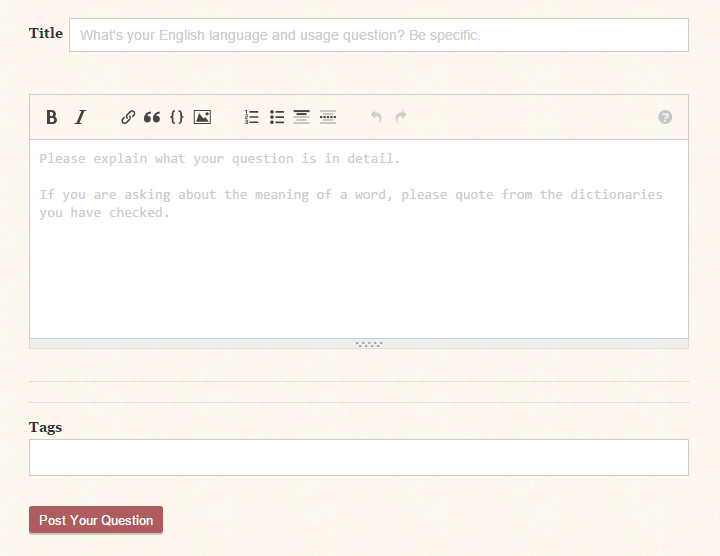 We plan to test a new, 'guided' version of the ask question page soon. This page would essentially break down all of the elements that make a great question, and give the user plenty of guidance as to why it's to their advantage to understand what's needed in each of them, and provide it. We're launching an initiative with the University Of Melbourne in Australia. Some graduate studies have uncovered what (could) lead to much more precision in the detection of duplicate questions, as well as a huge improvement on what duplicates are suggested to the person asking. There will be a separate post about that this week. We need to help them validate a ton of data, they've come up with a system to make it easy for us to help. More to come on that soon. We think the two things we've got planned in the new user experience category is going to have a pretty nice impact (most unhelpful questions don't need to be asked, if only we could let folks know we've already got their answers more effectively). But we want to do more. We're going to explore some ideas for better filtering of the questions that you see indicated by information that you give us. If you really only enjoy solving medium to difficult problems, that's what we need to prioritize showing you. We're going to have some discussions on ways this can be accomplished when we come to it. We're looking at some upgrades to the anti-spam and abuse mitigation systems. They've been good to us, but we need to keep them relevant. There are some awesome community-run projects that have been helping tremendously, and we're currently looking at ways that we might be able to integrate them more properly. Because at the scale that we see on Stack Overflow, existing tools are really starting to show their age. We want to end the need to manually suss out voting rings. We're working on making the scheduled tasks that identify these things much smarter, by teaching them to think like Shog9 and myself do as we analyze all of the data that we have access to. We'll find a lot more rings where action is needed, and stop showing moderators patterns that are actually pretty benign (but the tools they have really don't indicate that it's benign). Mods will get a sort of 'minority report' in cases where the system couldn't make an automatic decision explaining why it couldn't decide, show all of the information that the mod needs to make the call, and let the moderator decide. This is actively being worked on for feasibility, once we're sure the model scales we'll kick off a discussion with more detail. We're going to do more to make certain that people understand what they're doing by flagging and help them choose the correct way to proceed (and in many cases that probably means not proceeding). We'll break out into a separate discussion when we get to this. Moderators are far too often called to look at things where they aren't actually needed, and this distracts them from looking at the stuff where they are actually needed. "Should I downvote, vote to close or flag? Should I do all of that?" - we need to make this much, much clearer. And we've got the inverse of that, folks downvoting spam when they really need to be flagging too :) It's not an easy problem. None of these lists are exhaustive, there's more, but this is getting pretty long now. What's important is what you think we need to be prioritizing. So what do you think we should include in this round? Try to link to the feature-request, but don't fret too much if you can't find it (just explain what it wanted, and we can rely on Shog9's RAM-like memory for the location). New users need better awareness of what is expected of them when they ask their first question. This is the single most important thing that needs to happen on the Stack Exchange network, in my opinion. If the new Question Ask page will facilitate that, then I am enthusiastically supportive. However, there are historical barriers, some of which SE itself has erected, and some which are due to conflicting goals. Currently, we rely on a system of Help Center articles that new users never see, a patchwork quilt of Meta articles, and a Tour Page that focuses on site mechanics. We carefully bury any information that might help new users shed their bad forum habits, allowing them instead to crash headlong into a "hostile" user community that expects new users to already know our rules, and we call that being inclusive. Good software systems always follow the Principle of Least Surprise. If your system's behavior regularly surprises, then it fails its purpose. It is unfortunate that online behavior has been co-opted by the Facebooks, Twitters and YouTubes of the world, but if we are genuinely interested in making the world (or at least the internet) a better place, then we must also believe that we have (at least in some measure) a responsibility to educate people on how good communication really works. This isn't about being negative. It is about being proactive. Nor is it about providing better flagging tools, although we should do that as well. Rather, it is a mindset. The best off-topic question is the one that is never asked. Allowing sites to run off the rails by providing the lowest possible friction to ask off-topic questions and then saddling the community with cleaning up those questions... well, that's not what most of us signed up for, nor is it the best use of our time. It is probably the least-friendly way to welcome new users. Mass tag edits are disruptive to both new and established users, especially on small- and medium-size sites. There's no good way to edit all the questions of a nontrivial tag without thoroughly burying new posts on the front page. 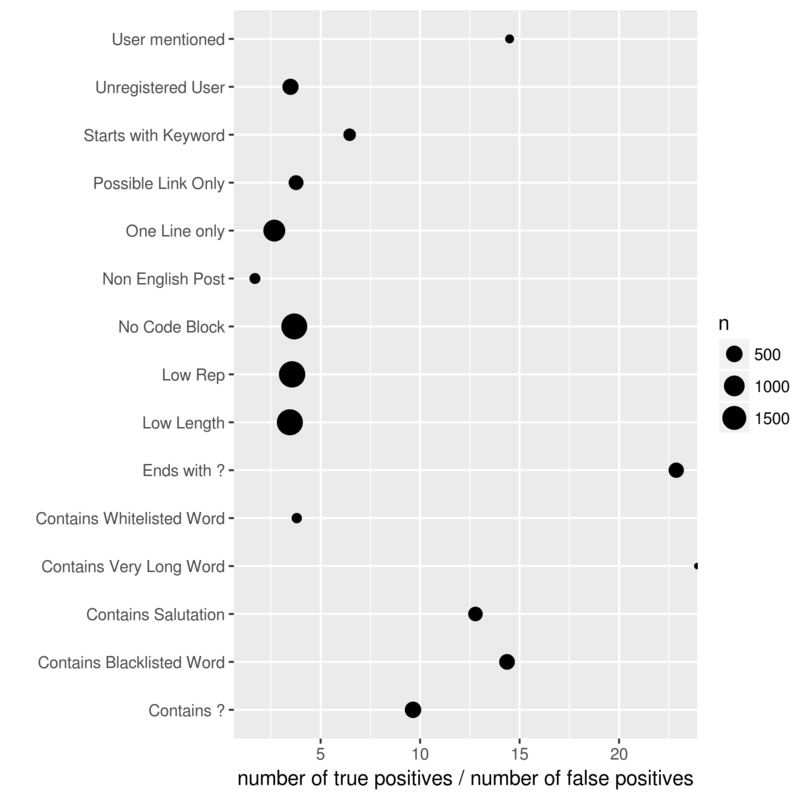 Tag edits without any review are understandably problematic, but other options are available – one possible tool is described in Tool for peer-reviewed no-bump mass retagging. Allow unregistered accounts to delete their own posts: this one should be fairly obvious. This occurs a lot when some unregistered user finds out that they can't delete their own post, and decides to just vandalize it. This is a restriction for no good reason ("Cookie-based accounts don't support voting, therefore they don't support deletion" doesn't help an unregistered user remove their post), so I'd support removing it. One of my friends who is new to the SE recently posted a question on SO and then quickly deleted it after I pointed out some issues. However, he finds that he cannot edit the question while it is deleted. Even high rep, experienced Stack Overflow users believe that this is possible. However, it is quite obviously not. I understand not wanting hidden spam, but bumping on undeletion would solve this problem. Further, I doubt that many spammers would even think of such a complex way to spam Stack Exchange, but many legitimate users want to fix their post if it was accidentally posted or a huge flaw was found. Allowing (at least some) users to edit their self-deleted post would be helpful. Thousands of questions get closed every day over the network, and newer users are more likely to get their questions closed. Yet little guidance is given to new users, so to be helpful, close voters often resort to canned comments! The information in these canned comments should really be provided automatically. There are several things that would improve user experience a lot and are technically easy to do. Helpful close voters may leave a comment, solely to notify the asker. Moderators on beta sites even get a nagging flag for that (“question closed without comments”). That's either busy work for closers or leaving the asker in the dark. If this question can be reworded to fit the rules in the help center, please edit your question. Oh, and get rid of the term “on hold”, which nobody understands. There is no need for a different word to mean “closed less than 5 days ago”. “If this question can be reworded to fit the rules” is so generic that it isn't really helpful. The guidance would probably depend on the type of closure — closing as unclear usually requires filling in missing information, for instance. A question reenters reopen review if it is edited within 5 days of being closed, but only after the first edit. I'm sure there's room for improvement, even though I don't have specifics to offer. It's very common that someone retags a question after closure, for example, and that doesn't make the question worthy of reopening; but when the asker comes back and adds missing information, the question has already accumulated “leave closed” votes and it's too late for the reopen queue to do its job. Edits by the asker should be more likely to trigger reopening, but edits made by someone who adds information that the asker provided in a comment should also count somehow. Instead of making migration a reason to close, make migration what happens if a question gets closed and there is another suitable site. “It belongs on site Y” is not a reason to close a question posted on site X if it also belongs on site X. On the other hand, if site X has closed a question then denizens of site Y should be the ones deciding whether to accept the question on Y, not denizens of site X.
I'm recommending Categories other than "off-topic" should allow custom close reasons be considered for this project. See Nathan Tuggy's excellent answer there to see how widely useful this would be to a variety of sites. This is an issue for new users who have their questions closed and what they see first is "off topic" which is confusing to them because they can't understand how their question is off topic (which it's not). This often requires a knowing user to explain that the question isn't actually off topic, it's ______. If they think the question is off topic, they may be less inclined to fix it, while if the main close header says "unclear what you're asking" instead, they may be more interested in improving their question. It's also an issue for new close voters/flaggers who may not be aware that these close reasons exist or have difficulty finding them because they don't fit the "off topic" category. New users need better awareness of what is expected of them when they answer their first question, especially when it is old. Robert explained about the issues created by uninformed users while asking their first question, so let us also extend that to answers. Almost all the posts that were small and ended with a question mark were NAAs! Almost all the posts that had wordings like "I have the same problem", etc., were NAAs! ALL the posts that had a combination of more than one of these factors were NAAs! The dataset of all the posts with feedback are here. What makes people write a question in place of an answer? The answer pop up links to How do I write a good answer?, but, that page never mentions about not writing a bad answer. That's the main issue that we have at our hand. Pre Answering: Make the user know what a BAD ANSWER is! Split the trio, i.e., help, clarification and responding, into three different bullet points (and provide examples). Lists are more helpful than writing them in a single line. Prevent the users from stating that I don't have rep, I answer by adding a link to Why is the 50 rep limit present? Inform the users about link only answers and their ill effects and Why should I not add a link only answer? Post Answer Writing: Make the user know that they did not read the rulez. Prevent the users from entering gibberish and non-English posts. Add an error label that mentions them that their post is not accurate for the site. Post Answer Submitting: Sigh, can't help, but help the reviewers. Reduce the number of reviews needed to complete an LQP Queue review from 6. Have binding flags, like the close votes. 3 flags soft delete a post. Add a "move to comment" privilege, with 3 votes needed (similar to delete votes). Let the high rep users also decide. Educate the 3k+ to review. Another personal request is to Enhance the "New Answers to Old Questions" moderator tool. It's really hard to use that at the state it is in, now. We can be sure that the users will continue to post NAAs even after these are implemented, but these should help us reduce the number of NAAs by a bit at least. On some sites, there are simple heuristics to detect problematic questions. By detecting a few problematic keywords, we can easily alert posters to potential problems before the question is even submitted. Title that says "wrong" or "incorrect"
The last two, in particular, would also benefit Stack Overflow. As another example, English.SE considers the use of monospace text for emphasis to be a faux pas that should be edited out. We have the technology to detect backticks and advise the poster to use italics instead, right? That would be preferable to bastardizing Markdown. By giving automated instantaneous feedback, we should be able to improve question quality and increase user satisfaction. That would be better than review queues, comments, waiting for the original poster to respond, downvotes, and close votes. A minor suggestion, but we can help make new askers more likely to accept an answer by pointing them to the "accept" button when they try to upvote and don't have sufficient reputation. Improve communication between flaggers and moderators, or, "what's obsolete about that?" Some sites are very chatty. And that means flags on comments. My biggest moderation time sink is comment flags, and, within that, obsolete flags. I don't know why it's obsolete -- was the post edited? Was the comment it replied to removed? Or is it not obsolete, but the guy arguing with that other guy is trying to remove comments he doesn't like? Can we add more information to "obsolete" flags? requests a little bit of tooling that would help flaggers tell moderators what the problem is, so we can handle the flags efficiently. We all have better things to do than to read through 20 comments and 6 revisions to figure out what the history is. On one of my sites we've asked our users to mostly stop using the obsolete flag and use custom flags instead, but this only works for people who've seen the meta post and remember. Also, it means we're giving the opposite advice for comments ("please use custom flags if you have any doubts") as for posts ("please don't use custom flags if the built-in ones apply"). That's confusing for users who aren't SE fanatics keeping up on every detail ("wait, am I supposed to use 'other' or avoid it here?"). One of the minor-ish things that I would like, and have been meaning to check on the feasibility of would be to add custom filtering for certain sites in the "Hot Topics" bar down the side. I don't really care at all about certain network sites, but often see a lot of their stuff show up. For example, I routinely have 3 or 4 from puzzling.stackexchange.com in my sidebar, no offense to those guys. However, every now and then I see stuff from other things like DIY, which I do find interesting, but I'm sure they're more often drowned in the noise from other sites. Perhaps other people find this useful too. If not, no worries! We still get too much of it. The built-in filters do an awesome job keeping a lot of it out of our faces, but they're not catching everything. SmokeDetector is reporting spam posts for people to flag, which is generating about 100 flags a day. That's around 50-60 posts per day, across the network. That's decreasing, but it's still 50-60 posts more than we need. Seriously though, that's crazy impressive. As part of this quality project, I'd like to see us do something about spam - that may be working out an integration strategy, it may be something else on SE's end, or it may be something that doesn't need SE involvement - but let's see how low we can get those spam numbers. Give new users better advice on how to write question titles. This is a problem on a lot of Stack Exchange sites, from what I've seen, and I think that helping new users could solve it. I propose linking to the above faq question somewhere near the input box for the question title in the first few questions from a new user, which can hopefully make titles, at the least, a bit better. Help new users understand that answers aren't for comments. This has been an issue for years and years and years. 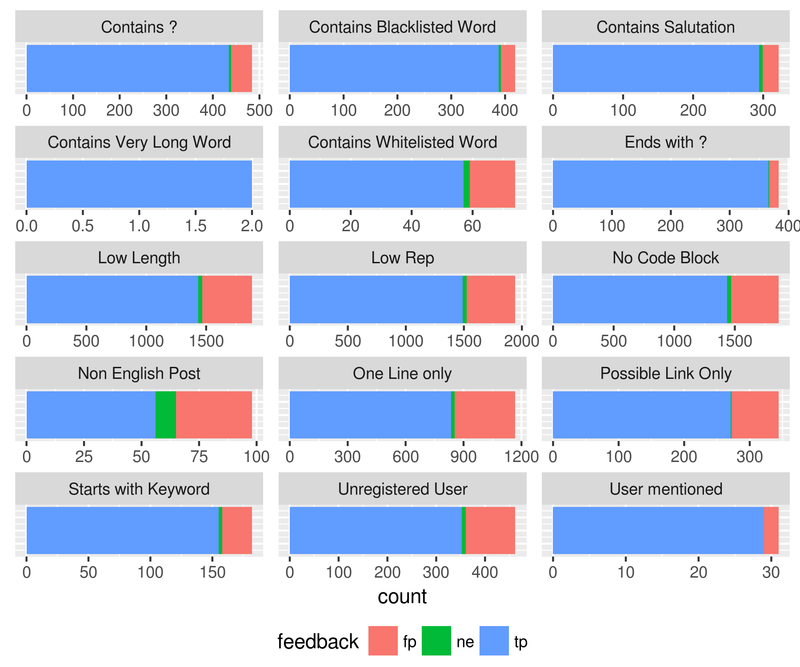 There have been loads of proposals to fix it - by getting rid of the 50-rep comment threshold, having low-rep users' comments reviewed, and so on and so forth. These specific solutions have been status-declined, for reasons I agree with, but I still think we need to do something to explain to users that they can't use answers as comments. A close feature-request I found is Low-rep users posting comments as answers, which suggests adding a pop-up in certain cases when new users try to post answers. A reasonable objection was that the Low Quality Posts queue often deals with these, but I think we can still do something to cut the issue off before answers reach the queue. Explain to these new users that they need 50 rep to comment, and link to the site's Privileges page. Explain why answers shouldn't be used for comments. Explain that comments posted as answers will likely be downvoted and deleted. It could contain examples (posts with the gist of "Me too! ", "Nice question! ", "I had the same problem", etc.). The pop-up could be shown to users the first X times they answer a question and have less than Y rep (should Y=50? ), with X hopefully fairly small. To be effective, it would have to be highly visible; putting it off to the side, as Blender suggested, might not be enough. "I had the same problem"
Right now, users with 10,000 or more reputation get to vote to delete 5 closed questions per day. This number increases as users get more rep, to a maximum of 30 daily delete votes. Why on earth do we not apply the same logic to close votes that are a lot less destructive potent than delete votes? Let mods (and 10k?) know when questions go "hot"
Because on small(er) sites, influx from the Hot Questions list can mean a disproportionate amount of not-quite-productive posts. A heads-up for community moderators would be great. The author is directly informed what people consider to be problematic about the post. (While they may be totally oblivious if their question is closed for another reason.) Thus they can act before there is any effective action on the post (resulting in disappointment and the difficulty to undo this action). The author is presented a reasonable choice of options how to proceed – either to accept the verdict or edit the post to improve it. Should they accept the verdict, there is no pointless waste of reviewer or moderator time. Reviewers, moderators, and other users are informed as to what the original flagger/voter thinks is problematic about the post. All of the above is done with the UI, not with a custom comment or similar. Note how I did not use the words duplicate, question, or closure to describe these advantages? I see no reason why a similar UI should not be applied to closing for another reason, impending deletion on an answer, and even comments. Adapt the mechanism for other close reasons. Introduce answer-deletion reasons (and get rid of the confusing and pointless distinction between VLQ and NAA (1, 2)); inform the author directly as to what is considered problematic with the answer; make it obvious to the author that they can edit or delete their answer. Give flaggers the option to choose a reason (instead of having only reviewers select canned comments). The UI of the low-quality queue badly needs an overhaul anyway (1, 2). Inform authors when a comment is flagged and why. This particularly makes sense when the reason is obsolete. It may also work if the discussion in the comments digresses or if answers are posted as comments. Authors of comments flagged for other reasons may not be so understanding, but at least they may take the hint after a series of their comments was flagged. Right now, persistent comment chatterers may not even notice tons of their comments getting deleted. Of course, in most if not all cases, flagged posts should still be subject to review if the author does not agree with the flag/closure. Also note that there are some cases where this is probably not a good idea, e.g., spam flags. It is a truly painful process to find a duplicate of a question you know has been asked many times before. The current system with the "frequent tab" is not working well. It is based on close-as-duplicates and similar activities, rather than community consensus. A number of "canonical FAQs" eventually spawn from this system over time but they drown in the number of less canonical questions present on the "frequent tab". And we always end up with several "canonical duplicates" to the same question. After speaking with many other users who do lots of user moderation in their favourite tags (gold badge/dupe hammer), it turns out that almost every such user uses the site's "favourite" feature as their own private "canonical duplicate" list for moderation purposes. Essentially every such user has created their own FAQ. There must be so many great links gathered in each such private FAQ, but they aren't shared with other user moderators. On SO there exists one case where the C++ community has taken the matter in their own hands and created a tag c++-faq (link). The site has allowed this because their FAQ system is heavily user-moderated. As a result, this system works far better than the "featured tab". Instead of having all these "private FAQs", shouldn't we gather all this knowledge into creating an official FAQ system that actually works? Which is tag-based and points at FAQs/canonical duplicates for each tag. Which is created explicitly by the community, rather than implicitly/by chance. Meta Request: Get rid of "Jeff said so"
Over the years, I have encountered several instances of "Jeff said so" reasoning, that is design decisions were justified with the opinion of the founder of SO but little else. Well, he'll soon have been gone for longer than he was here. Please keep an open mind regarding ideas that violate policies/principles that "have always been there". The network has come a long way since the days of Jeff. Once reasonable assumptions do not fit anymore. Can't believe no one has posted this one yet... Allow badge holders to have binding close and reopen votes for other close reasons. The duplicate "hammer" has been... Wildly successful. But perhaps most surprising is how popular instant reopen votes have been: over the past 90 days, just a hair under 60% of all reopened questions have involved a gold-badge holder swinging that hammer of mercy. Turns out, folks who've answered a crapload of questions to great success are as likely to call out incorrectly closed questions as they are to close those that need it. ...So why are we still wasting all this time with voting? Let's at least extend it to "Unclear", the reason I'd wager folks who've done a lot of answering are more than adept at gauging. Maybe disable it for questions that've already been answered (our definition: +1 answer or accept) just as a safety check. And just make reopening available across the board. We currently have some handy tag-specific alerts when asking questions with certain tags. These are for certain problem questions that are only a good fit for the site if they follow certain requirements. The alerts list these guidelines and specific requirements. These alerts are great, but they don't go far enough and people simply ignore them a lot of the time. I propose we make these more prominent and permanent. They are currently (I believe) only implemented by devs on a case by case basis, let's give that power to the people who care about them (certainly mods and maybe high rep users). I'm not totally sold on my mockup, it's just a quick idea. Maybe the check boxes on each point are too much, I don't know—but there needs to be some interaction. That'd let us get meaningful numbers on how useful auto flags are - right now I tend to dismiss them as helpful whether they are or not, just because it's two clicks vs. four clicks. I don't know what, exactly, we'll find from this... but I know we'd find something. There are plenty of auto flags that aren't really necessary, and mod time wasted on those can't be used in other (more valuable) places. This would let staff look for / verify patterns on a deeper, more objective level than we currently can. The biggest quality problem I see in the site where I spend most time (PPCG) is the Hot Network Questions sidebar. It's set up to promote cheap questions which anyone can answer without thinking, and because it channels in people with association rep allowing upvotes but not downvotes it self-reinforces the promotion of those questions and gives all newcomers (those who arrive via HNQ and those who simply find the site and look at highly voted questions) the impression that that is the best type of question to ask. What should the system be deleting automatically that it already isn't? which put forward a lot of good ideas, but apparently no conclusion was reached. Time for roomba to ignore comments, which generated a lot of discussion and seemed to be received generally positively. I personally liked the idea of at least ignoring comments that happen within the first week. That's a very small target demographic, but the requested changes are pretty minor. Bring back the indicator of the number of votes cast in the current quota period. Relax the voting quotas. I shouldn't have to care that it's almost midnight and I need to get my voting done or else I'll run out every day until next week-end. Allow delete votes on positively scoring answers - obviously we need to scale the delete votes along the same lines as question delete votes are scaled so that it's next to impossible to delete something that's highly upvoted. If a bad answer that's got a couple of upvotes starts to attract delete votes then it might prompt the OP to fix it up, others to fix it up or add a new answer themselves. Obviously delete votes should age away, perhaps more rapidly if the post has been edited since the vote was cast. Educate users more to remind them that they'll get their precious 1 point of rep back when the offending answer is deleted. Make downvotes on answers free to the caster - or perhaps at least after a certain reputation level/length of time on the site. I think that this will have a big impact on quality, as I am sure many people are reluctant to hit that down arrow because of the -1. "What!" I hear you say, "people are reluctant to lose one point of reputation when they see something bad?!?!. That's just crazy". It may be crazy but I fear it's true, especially for low rep users who are struggling to reach the next privilege threshold. Poor quality answers being left on the system with no indication to say that they are poor quality. Users flagging for moderators to delete stuff because they can't do it themselves as the post is not negatively scoring. All-in-all not useful. A word of warning though - if down-votes are free it becomes easier for people to down-vote all the competing answers on a question. We'd need to have a way of spotting that and either preventing it (the -1 remains if you've answered the question, or add an answer later), reversing it automatically or flagging it up to the moderators. If the community. properly peer reviewed, can do the cleanup there's less work for the janitors to do. Moderators can not always be sure about whether a question fits site policy, especially if they are not experts in the area the question is about. Also, they may want to defer certain decision to the community, i.e. promote a more democratic approach to community moderation. In particular, they may have to "train" their users to use the tools they have as the site grows. Currently, there is no tool to do this, short of opening a second account for casting regular votes: every action a moderator takes is immediate and binding. I think moderators need tools to prompt regular users into action. If you use the full site, then a lot of things require horizontal scrolling if your screen is less than the prescribed width, and some things are simply placed off-screen. I'm not sure what the prescribed width for ordinary users actually is; I know that my preferred width (which, guess what, depends which computer I'm using) usually isn't enough. For moderators, there's an indication of the presence of handled flags or deleted comments on a post in the left margin¹. It's provides information which otherwise can only be seen behind a lot of clicks and manual URL modifications. To see all moderator tools, a minimum of 1400 pixels is required (more on a site that gets more than a double-digit number of deleted comments on a post, down to 1361px if you don't mind seeing how many deleted comments are on a post). That gives a handy empty ~150px bar on the right for… um… why would you want to have an empty margin in a window? I don't know but I'm sure that studies show that 93% of users prefer more than 100px of empty margins in their windows. Or whatever. Instead of making it worse to fit more ads, make it better. Remember, your money may come from advertisers, but your content comes from users. Without content, you wouldn't get advertising revenue in the first place. If you use the mobile interface then a lot of functionality is missing. The apps are even worse (at least the Android app is so buggy it isn't ready for prime time if you want to do more than read and vote). This isn't the 1980s. This is the era of browsers using hundreds of megabytes to display a web page on a wide variety of different hardware. There's no excuse for designing for a particular screen width. ¹ Unless you move that with ArtOfCode's userscript. My pet popular-but-ignored feature request is "Crossover Questions". I realize that this would probably be very, very far from trivial to implement, but there really is enough overlap between many of the SE sites that I think this would be pretty useful. While I do not think that crossover-questions would replace question-migration (since some questions really are off topic on the original SE to which they're posted but on topic at a different one), I do think that since the question-migration feature is currently the only feature that provides some sort of cross-site per-question "sharing", the lack of the proposed crossover-question feature is probably not entirely unrelated to the fact that the way we think about the purpose and motivation of question-migration is currently a hot topic. NOTE: The top-voted answer on the linked meta-question fleshes out the proposal and is very worth reading. In particular, it discusses how questions will be nominated and accetped as crossover questions. It also discusses how voting, moderation, and so on should work. On many sites the biggest new-user problem isn't bad questions but bad answers. People see a question, see a textbox, and type their personal opinion into it, or tell a related story, or ask another question. Yes, people will probably flag them and they'll go to the review queue, but that's later. It would be better if we could get out in front of it. 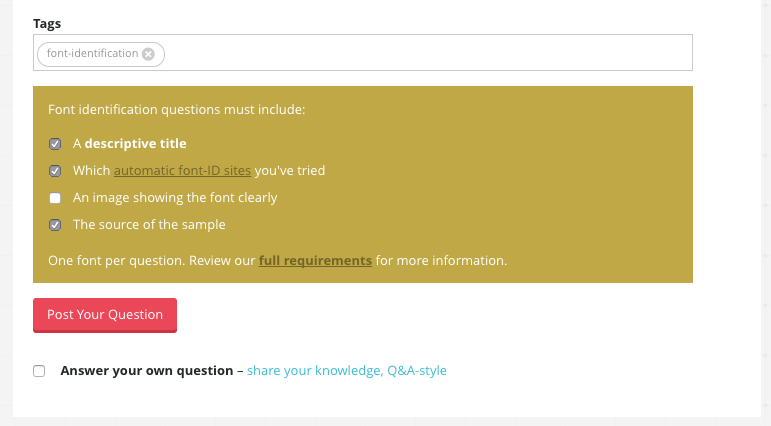 We should develop a template "how to answer" topic for the Help Center and allow sites to edit it for their own particular rules. A new user (first answer? rep below a certain threshold?) should see this information when he starts to answer a question, along with the other guidance that's given. Let's help newcomers meet answer guidelines from the outset, rather than finding out only later when the downvotes and comments start rolling in. Not the answer you're looking for? Browse other questions tagged discussion se-quality-project .